The most recent geological history, in the last hundred thousand years, has been characterised by cycles of glaciations, or ice ages. The historic temperatures, through these times, have been low, and continental ice sheets have covered large parts of the world. Through ancient air, trapped in tiny bubbles in the Antarctic ice, we have been able to see what the temperature cycle was at that time, and also the concentration of carbon dioxide (CO2). 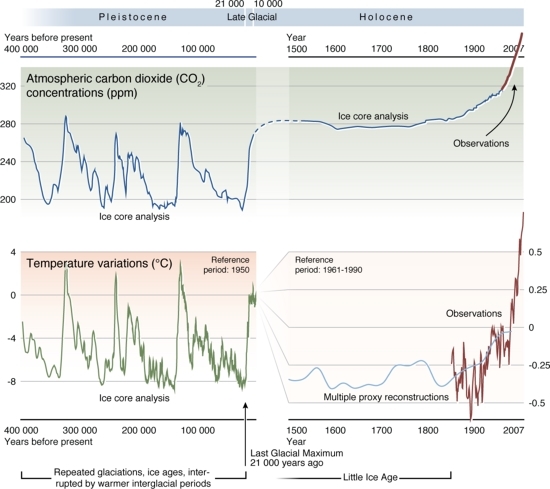 The more recent history, from the middle ages and up until now, show increasing temperatures, rising as the world emerged from the Little Ice Age (LIA), around 1850. With the industrial era, human activities have at the same time increased the level of carbon dioxide (CO2) in the atmosphere, primarily through the burning of fossil fuels. 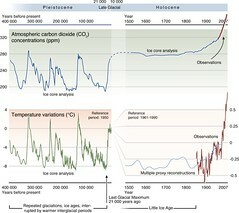 Carbon dioxide is one of the main greenhouse gases, and scientists have been able to connect human activities as one of the drivers to climate change and global warming. The top part of the CO2 measurements, the observations, are what is referred to as the 'Mauna Loa curve' or the 'Keeling curve'.